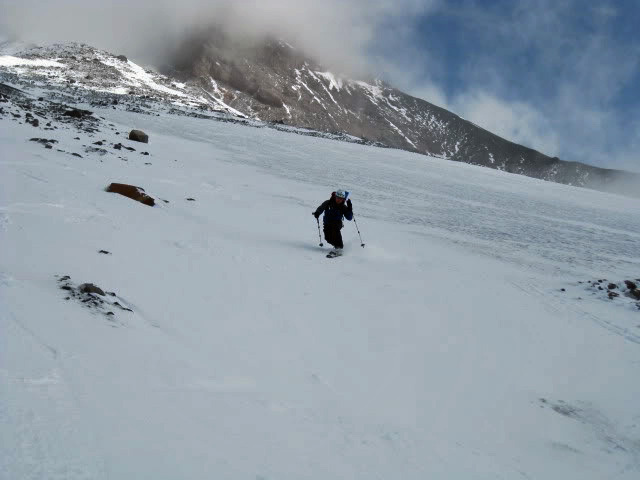 About the only viable option for turns this October was Mt Hood. 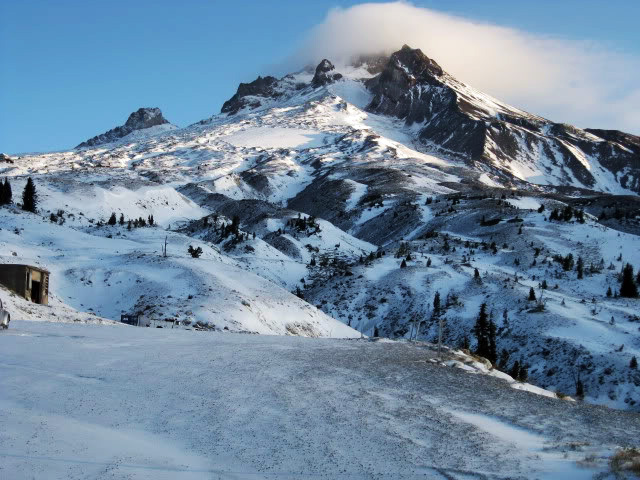 I left the Southern Willamette Valley around 5 am with plans to meet up with Todd and hike/ski the Palmer Glacier. We arrived at Timberline around 7:30 to partly sunny skies and a bit of fresh snow. Today marked my 47th consecutive month of snowboarding at least once a month. Here’s the view that greeted us upon pulling into the parking lot….. Even with the fresh snow, it’s disturbing how little residual snow remains on the Palmer “snowfield” seen in the middle of the above photo. 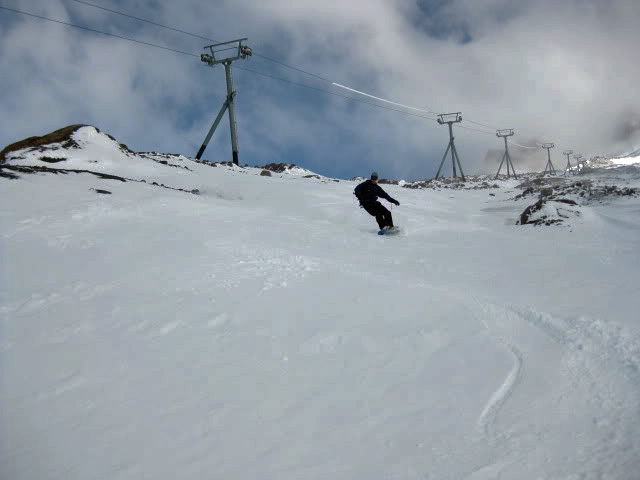 Still though, it was refreshing to see the fresh stuff go from dreaming about new snow to actually riding on it. Today I was testing my homemade Burton Custom split, and it didn’t disappoint. We started skinning above the base of the Mile Canyon and the board performed flawlessly. I didn’t miss the metal edge which was an initial concern, though we didn’t encounter anything too steep. The sunny skies that we had on the way up gave way to clouds for the ride down, so getting any good action shots was difficult at best. We did manage a few though. My board rode really well in ride mode, and performed as well as any other split I’ve ridden in the past. 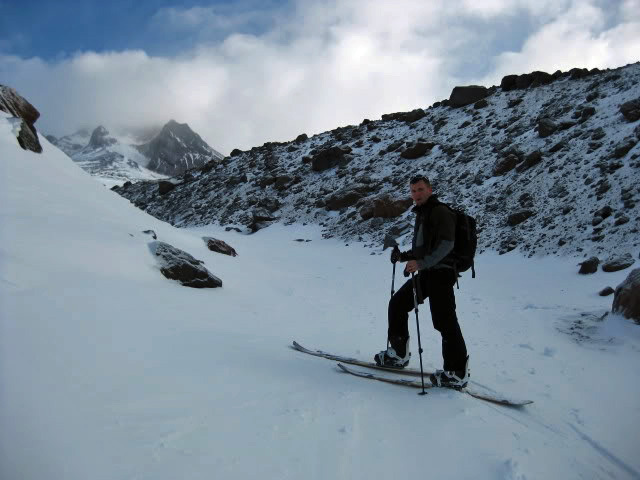 In fact, I’m really happy with the overall performance given the challenging snow conditions. The ride down the rest of the Palmer and Mile Canyon was fun. There were pockets of fresh snow a few inches deep deposited by the wind, but also spots of fairly firm residual snow. Riding the Mile Canyon when it’s mostly devoid of snow if actually pretty fun. Down at the bottom of the canyon, the T-Line cats were parked and ready, waiting for more snow to start the grooming, probably in a few more weeks if it keeps snowing. 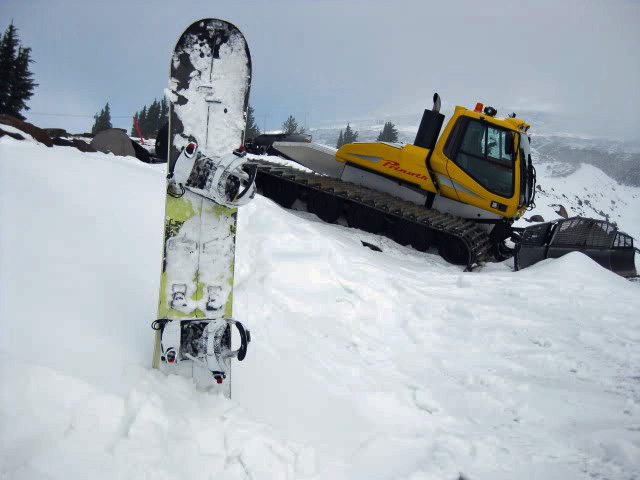 Homemade splitter and Timberline snowcat…. At the bottom of the snow, we packed our gear and hiked down to the cars in the parking lot. We were able to make it to Government Camp in time for lunch, and the cold beer tasted really good. College football was on the big screen and the burgers hit the spot. I love this time of year – it won’t be long now until winter is here in full force! Let it snow!